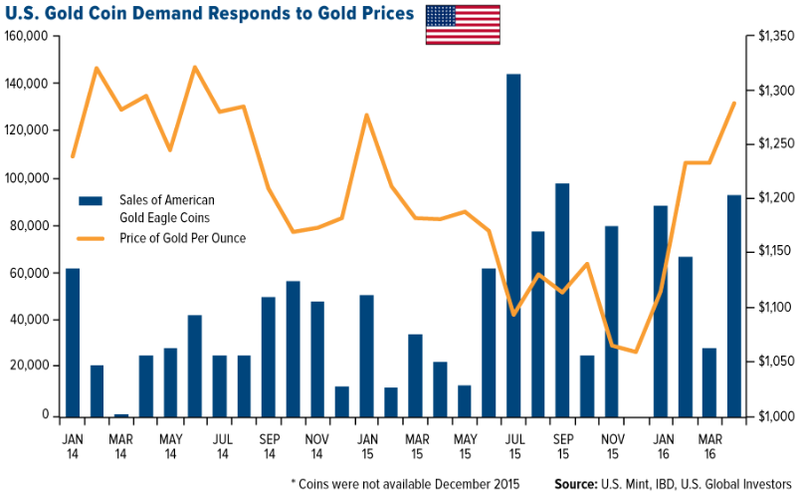 How Strong is Physical Demand for Precious Metals? Physical demand for gold and silver has been incredibly robust in the past year. Investors are once again flocking to precious metals, as gold just had its best quarter in the last 30 years! This occurred despite the dreaded FED rate hike that so many gold investors had feared. Demand for gold has been nothing less than jaw-dropping. Even JPMorgan made the bold claim that gold has entered a new bull market. And hedge fund manager Paul Singer has believes we are at the beginning of a rebound in the gold market. The crowd is starting to realize the poor situation the economies globally are in which has been masked by the Central Bankers’ liquidity. But one should never replace long term solvency with short term liquidity. Total domestic business sales are roughly 15% lower than in 2014, a steady decline for the last 2 years. Earnings from corporate America have fallen for 4 quarters straight – this does not occur unless during a recession. In April alone, commercial bankruptcies jumped over 30% from April of last year. The inventory-to-sales ratio is at levels that have not been since the 2008 Great Recession – this means all the production of goods is sitting in warehouses unsold. What does that mean for future GDP growth? Announced planned job cuts by companies so far in 2016 are 25% higher than the same time-frame last year. U.S. GDP in Q1 2016 was worse than expected, coming in at 0.5%, with expectations for Q2 GDP growth at an abysmal 0.8%. The list most surely could go on. Understanding all this, the recent accumulation of gold by private investors, governments and central banks alike is intriguing. Central Banks around the globe are scrambling to get gold in their vaults – especially from the Eastern hemisphere. China (#1 producer) and Russia (#3 producer) in particular have been producing substantial amounts of gold and keeping nearly all of that gold within their borders. Of the buyers, Russia (+46 tons), China (+35 tons), and Kazakhstan (+7 tons) were the most active in the market. Capital Economics, an economic research firm, came to the unsettling (yet obvious) conclusion for the global Central Bank gold lust. They are diversifying away from the U.S. dollar, as well as protecting themselves from currency volatility. Since the U.S. dollar is the reserve currency, that means the main asset held by central banks around the world is U.S. dollars. So, “protecting themselves from currency volatility” really means they are protecting themselves from the future demise of the U.S. dollar. Central Banks are not the only skeptical parties: U.S. gold coin demand has been insatiable as prices fell in recent years. Private investors noticed a discrepancy between the price and its value. The lower the paper market prices, the more physical demand emerged. Silver demand is exceptionally strong – pushing the domestic supply deficit to a new record. The U.S. and Canadian Mints together set a new record for silver ounces sold during 2015. The recipe for higher prices: falling supply and growing demand. 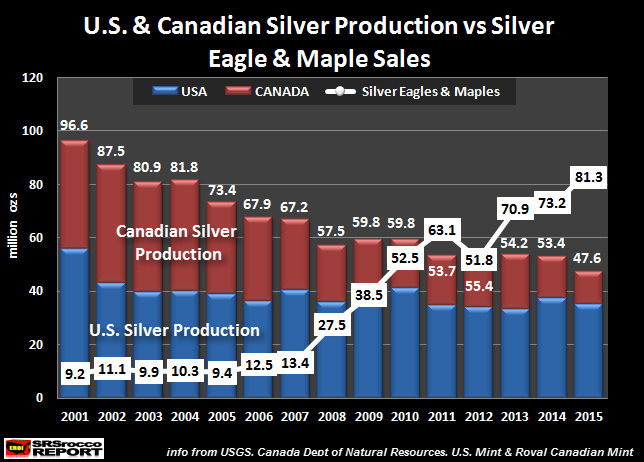 Total Silver Maple & Eagle sales in 2001 were less than 10% of U.S. and Canadian Mine supply. Thus, these two countries had plenty of silver to supply their investment needs that year. However, the U.S. and Canada had to import 33.7 Moz in 2015 just to produce these two official silver coins. As the frenzy for gold continues, silver will not be passed over, which is evident in its 25% increase in price since beginning of 2016. 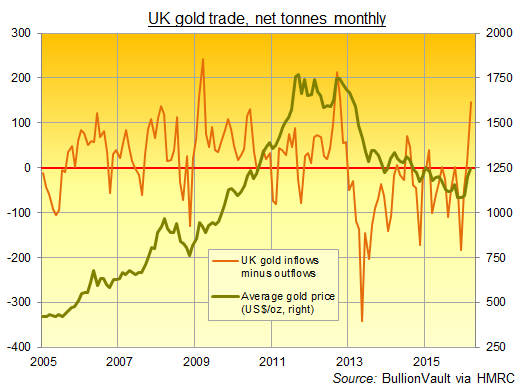 Britain is having substantial inflows of gold that it has not had since gold’s bear market began in 2012. London is home to some of the largest gold vaults and is the central dealing point for wholesale gold worldwide. Thus as gold price goes up, gold flows into London. This is bullish. 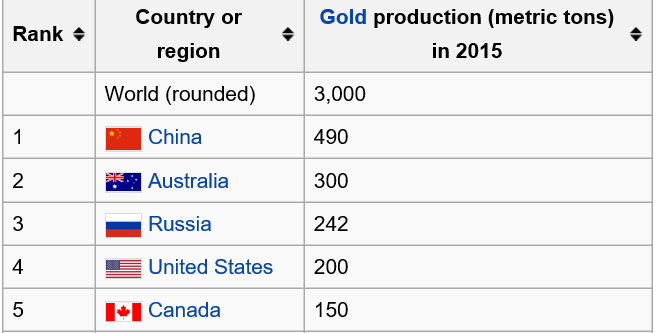 The other big gold importer (right behind China) is India. The Indian government has waged war on gold with the intention to cure India’s trade deficit. The Indian government does not add gold to its reserves, places large taxes on gold sales, discourages gold purchases and has no domestic mining supply – thus depending on imports. Therefore, following a mercantilism approach, the government believes that to fix the country’s trade deficit they need to cut their largest import, which is gold. 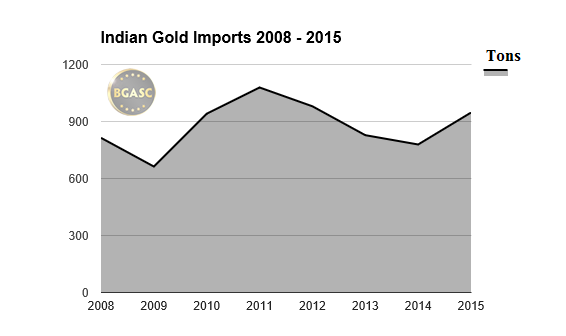 Even with all of this, Indian gold imports are still robust and a sizable black market has emerged. But imports could be higher if the government was not interfering. Yet, where there is demand, supply will find a way in. Expect smuggling of gold to increase tremendously into India, as it has been already. India’s gold imports could hit a record high this year amid widespread smuggling to sidestep government levies on overseas shipments, Australia and New Zealand Bank, Asia’s biggest shipper of physical gold, said on Wednesday. Mr. John Levin, Head of Precious Metals at Australia and New Zealand Bank (ANZB), believes there could be a record amount of gold going into India this year. A lot through unofficial gateways i.e. smuggling into the country. During Q1 of 2016, there had been an ongoing country-wide strike by jewelers in India to protest the government’s tax rises. In essence – India’s jewelry industry grounded to a halt (down 40% year-on-year). But now that shops are re-opening and wedding season is coming, gold demand will resume as before the strikes. 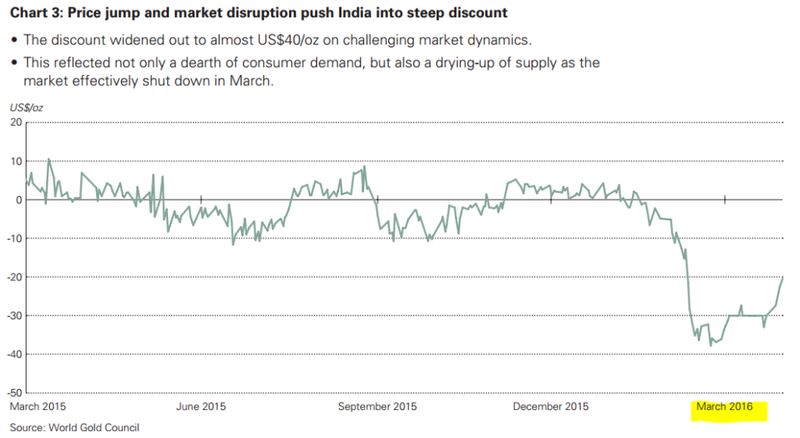 Imagine what the market will look like with the return of demand from Indian buyers. Gold ETF’s and Trusts are having exceedingly strong inflows year over year. The trend for gold does not appear to be ending. As many large banks capitulate their bearish positions (JPMorgan for example) and turn bullish, prices will increase. Just as central banks are diversifying out of paper dollars, investors are doing the same for themselves. The logic is if the purchasing power of money rapidly depreciates, the rising purchasing power from precious metals will offset the fiat losses. Imagine the year is 1995 and person A put $10,000 dollars in a safe, and person B put 25 ounces of gold in a safe. In 2016, which has more purchasing power? Who is the one left smiling? As long as there are central banks, the paper money will be depreciated. And as long as there is paper money being depreciated, gold will become more valuable against those depreciating fiat currencies. Gold has maintained its purchasing power for thousands of years and this trend isn’t changing anytime soon. Those with the fortitude to buy during manipulated paper corrections, stand to see their purchasing power and true wealth increase my magnitudes. Will you be one of them? While physical demand for precious metals has been robust and prices are rocketing higher, it is the mining stocks that have been generating enormous returns. They have been offering leverage of 4 times the advance in the gold price during 2016. While gold is up 20% year-to-date, the popular mining stocks ETF (GDX) is up 80%. Best-in-breed miners are up an astounding well over 200% so far in 2016! We don’t advocate putting all of your money into mining stocks. But you can take advantage of this leverage and occasionally book profits to be used to buy more physical gold and silver. This strategy will net you a significantly larger physical holding over time that simply purchasing bullion. If you would like to view the mining stocks that we believe will outperform this year and beyond, click here to become a premium member. Adem Tumerkan is a contributing author at Gold Stock Bull. He is a rising expert in the contrarian investment field and precious metals market. With an extensive knowledge of financial history, he applies Austrian economic theory with a wide range of value investing principles to discover undervalued and unappreciated investments in underrated markets around the globe. At age 25, he has already spoken at international investment conferences, along with having multiple articles published on established financial sites. He has advised publicly traded companies as well as organized and facilitated in equity raises for companies.